Below are a collection of resources that could significantly improve classroom teaching for dyslexic students. Implementing some of the strategies suggested will improve attainment for all learners not just those with specific learning difficulties. Achieve Now are HUGE fans of Nel Mackay. We use a lot of his techniques in our after-school learning support clubs. This dated video is excellent as it helps educational professionals understand how & why dyslexics struggle in school? F.A.T. City. How hard can it be? The link sometime stops working. 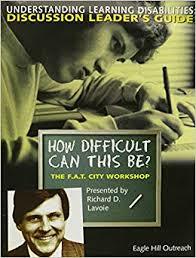 If this is the case just search YouTube for ‘FAT City workshop Richard Lavoie’. It is well worth the search. Be warned it is a long video. Perhaps watch it while doing tasks that do not require your full attention. Telegraph article February 2017 discussing the disparity in the use of access arrangements between independent and state schools. That is, one in five students were given extra time to complete their GCSE and A-level exams last year in independent sector. This is significantly higher than the one in eight pupils given additional time at state schools. A wealth of excellent resources provided free of charge by cognitive psychological scientist who have done extensive research on learning and education. Their vision is to make scientific research on learning more accessible to students teachers and other educators. These resources are not designed for learners with specific learning difficulties (SpLD), however students with these difficulties benefit greatly from better understanding how they learn and by utilising the techniques explained. Again this resource is designed to help teachers in general and is not aimed at teaching students with specific learning difficulties. However the teaching tips will certainly benefit students that find academic learning more difficult. It contains 10 videos each approximately three minutes long. A tip from Achieve Now, each video has a 30 second introduction and a similar length close out. If you are short of time, skip them to help you get to the content quicker.